To begin the show, Jackie shares her experience in recently participating in the Disrupt Speciesism Challenge, where she entered a Safeway supermarket to “disrupt the unspoken and hateful ideology (speciesism) that leaves animals killed or in cages”, as the Facebook event for this challenge that leads up to September 28th reads. It was a brave action by our host, and by others who have also risen to the challenge! Our first interview is with David Lee. He is the founder and owner of the Field Roast Grain Meat Company, a business that he started in Seattle, WA, in 1997, where it is based out of today. 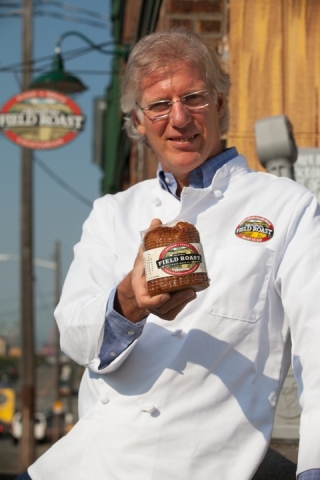 His company produces a variety of traditional “meat” products that are made of his special grain meat recipe, and these completely plant-based foods have garnered the following and praise of many vegans, vegetarians and omnivores in the United States and Canada, alike, who love the taste and texture of his Apple Sage or Smoked Tomato Sausages, or Celebration Roasts, to name a few favorites. However, as of just a few weeks ago, here in Canada, the Canadian Food Inspection Agency, or CFIA, has declared that Field Roast is no longer allowed to distribute in Canada unless its specific food labeling laws for what they call “simulated meat products” are adhered to. They say that such “simulated meat products” must fit the same nutritional profile as that of animal protein, and these regulations can be seen on the Government of Canada’s Justice Laws website here. In this interview, David shares his story in this whole situation. He explains the philosophy behind his vegan products that he does not see as meat simulations but rather a “meat” of their own identity made of plant-based ingredients, and he tells us what his plans are to work with the CFIA in order to keep Field Roast in Canada. Our feature interview is an Activist Profile with Alexandra Paul. She is primarily known for her career as an actress, having starred in over 75 feature films and television programs, and being well known for her role as Lieutenant Stephanie Holden on the tv show Baywatch in the 1990s. But her extensive acting career makes up only one of her life’s accomplishments, and she acts as a social activist in many arenas, including political, environmental and animal activism. An ethical vegan, Alexandra will be the recipient of the Vegan of the Year Award at this year’s Last Chance for Animals Gala. She was also presented the ‘Activist of the Year’ award in 2005 by the American Civil Liberties Union. In this interview, we have a lovely and inspiring conversation with her where Alexandra shares her story of how she grew up to become an advocate for the animals, and how this affects her in her daily life and longtime career as a Hollywood actress. She speaks about what being vegan means to her in opening her compassion in all facets of her life and being able to live in alignment with her values. She also talks about the intersections between other social justice movements and animal rights, and she shares with some of the projects she is currently working on for the animals, such as a campaign to stop animals testing, and a feature film she is producing about the founder of the Animal Liberation Front. In this video message for Peace Day, Alexandra encourages us to adopt a vegan diet as a way to promote worldwide peace. Excellent advice!